“Give it All, Zero For Rules!” shouts Mattin. For some, free music software isn’t just a way of saving money. It’s a way of life. 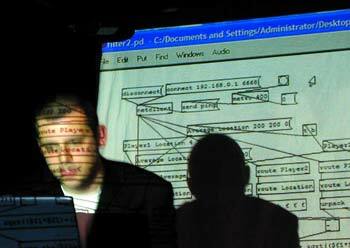 At the center of the debate is a semi-rivalry between two similar programs: Pure Data (aka “Pd”), and Max/MSP. Both Pd and Max/MSP use a similar interface, allowing you to build custom music, video, and multimedia applications by visually interconnecting objects. It’s not quite programming (though in each you can code your own objects if you like), but it offers many of the benefits of programming visually, and in real-time. Pd is free/open source; Max/MSP costs a few hundred dollars. Max was originally the creation of Miller Puckette while at the IRCAM research center. Max grew into various generations and flavors from the early system, but musicians have gravitated toward one of two variants: Max/MSP (and Jitter) is maintained as commercial software by Cycling `74, an offshoot of development work that began at Opcode in the 90s with David Zicarelli, while Pd is an open-source, free project that grew out of continued development work by Miller Puckette. The two can coexist, and often even share externals (add-on objects). For many, both are simply useful tools. For others, though, the fact that Pd — and other programs — are open source has heavy political implications. Mattin, for one, interprets “computer music” literally, “playing” the hard drive and bowing the computer case. If you want a heavy dose of radical theory, see the extensive manifesto stay free (which is openly anti-Max/MSP), or the Give it All, Zero for Rules! article — the latter being more useful, with links to people actually using this stuff. I’m not as interested in the free vs. commercial discussion, so to me, both of these are fantastic tools. Pd’s free nature is important: not everyone can afford Max/MSP, particularly students (important to us teachers). Each has some unique capabilities, so if you’re serious about this kind of work, you really should have both on your hard drive. And if you can invest in Cycling ’74’s software, it really is worth the money in terms of the payoff in maturity and usability. For me, the answer has been to use both. I am sympathetic to the ‘stay free’ argument, though I can’t agree with it. I’m not sure why we’re so hung up on the idea of free software — I’d like to start with the idea of free health care first, and move from there. (Yes, people in the rest of the world behind the US, I know YOU have national health care, but I’m here in America, so I can’t get as emotional over free software!) Commercial software enables those privelaged by extra disposable income to support the endeavors of programmers, thinkers, and an industry for music, and that can coexist (rather than compete) with open source software. But, of course, that’s the point: this is about choice. Choose a tool — or choose both, or neither — and make music. Even just using free software, you have more musical choices than you could ever use. Zero for rules, musically speaking.